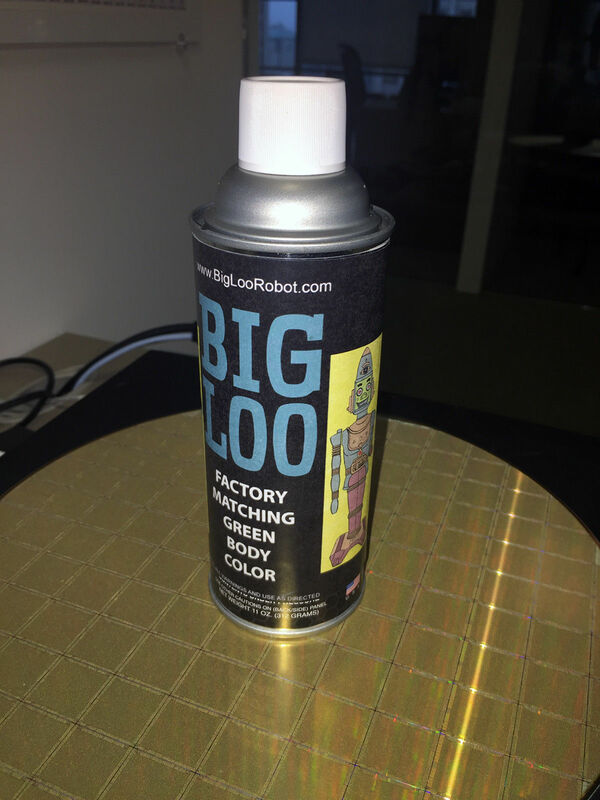 This Spray Paint has been Custom Mixed to Match the Big Loo Green Perfectly! Repair or renew the look of your Big Loo with this factory matching green spray paint. Ideal if you have patched a crack and filled with putty or other plastic filler. We have included some recent photos of repairing a Big Loo that was completely apart and we glued back together. We applied plastic filler and sprayed several coats which blended perfectly. As you can see, you can’t tell where the applied color starts or ends. These are raw photos which gives you an excellent idea of the paint’s matching capabilities. This paint is also great for matching broken crank handles with after market reproductions that the green shade is clearly non-matching. And the only solution if your Robot was commando colored with paint by a 10 year old in 1963. Lastly, if your Robot was so exposed to sun that even acrylic oxidizers will not bring back the shine and the correct green shade – this spray paint will make him looked like the day he was born at the factory. To repair the main body of a Big Loo today, requires us to apply spray paint and match the factory injected color. The color is unique onto itself and not found in commercially available colors. Not only is the shade usual but it also has a somewhat of a metallic finish. In the past, we attempted to match the shade with over the counter sprays that at first, looked like it would be very close. We were always extremely disappointed that all the paint matching attempts dried far from a factory look. In fact, not even close. 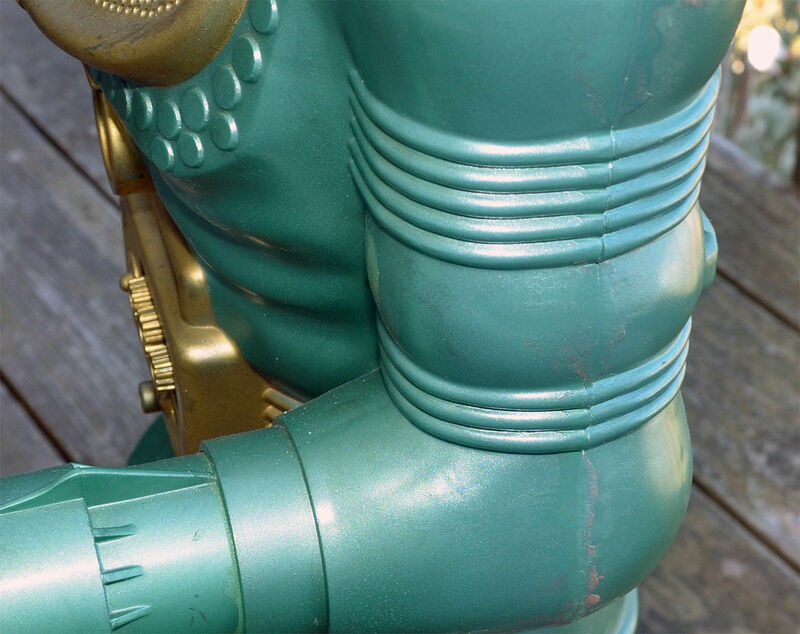 We eventually contracted a custom paint company to custom mix the much sought after Big Loo Green. The color was not “scanned” but they did use a spectrograph and other paint professional matching techniques to arrive at the factory color. This custom color request was very expensive and is not representative of what you would pay for economical available spray paint. We used this paint to repair a project Big Loo and ordered extra paint to share with like minded enthusiasts with hopes of recouping some of our custom costs. When this paint is gone, there is no more. If you only have a small area to repair, this paint should blend in perfectly. Not only is the shade correct but it contains just a hint of a metallic finish, just like the factory Big Loo in 1963. In rare instances, a Big Loo could of of been exposed so much sun and warm temperatures that the injected color is faded to a extreme level. In that case, you could respray the entire torso to return him to the factory shade. 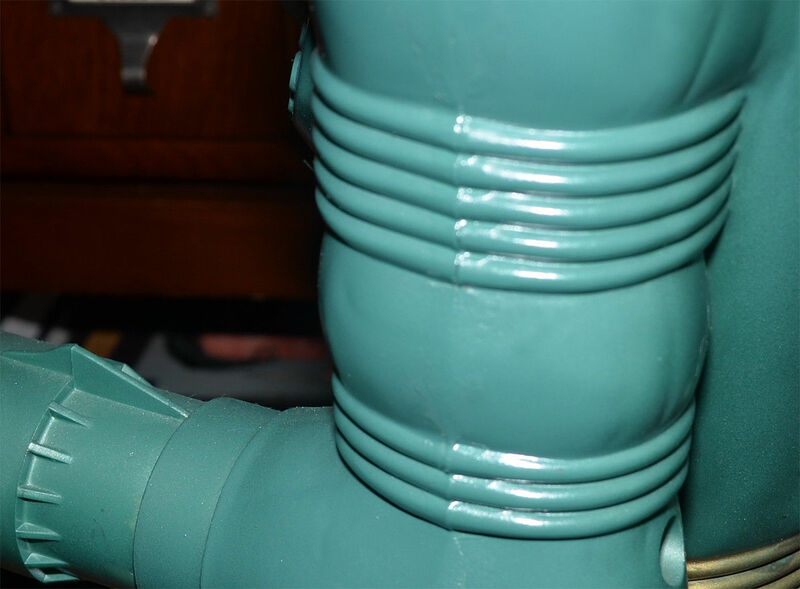 Be aware that the original green color of the 1963 Marx Big Loo was pre-mixed into the liquid styrene plastic in bulk and then injected into molds to form the main body. The maroon legs got their color from pre-mixing the maroon into the styrene as well. 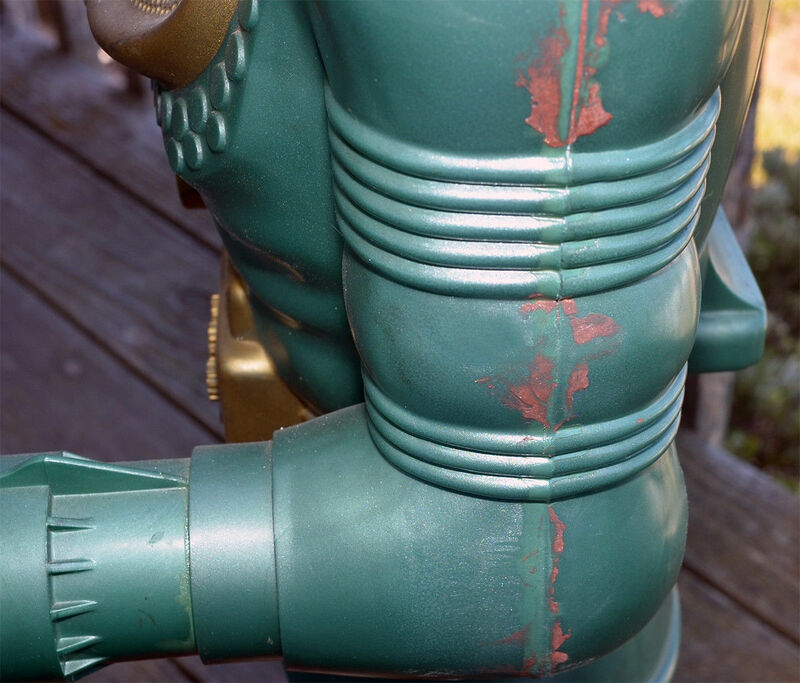 However, the gold sections of the robot were painted over either the injected green or maroon parts. In the photos below, you can see a seam filled with poaching material and then a shot of one coat of paint, then the final coat which blends perfectly!